I’m not talking about the early-morning view when the alarm clock buzzes and you roll over to see your spouse’s bedhead staring back at you. 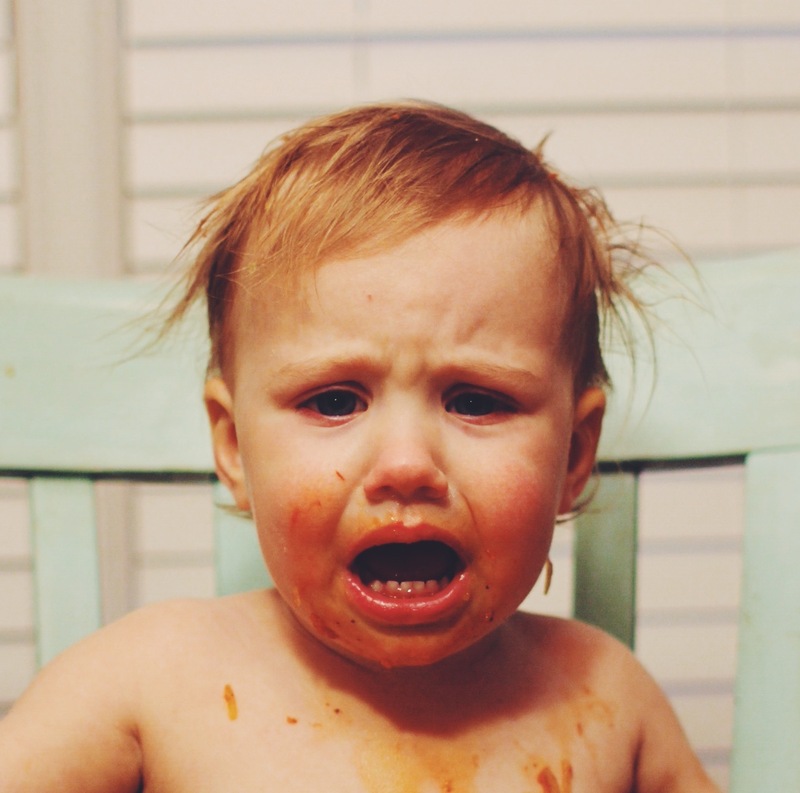 Although I’m willing to admit I look a little–okay, a lot–like my youngest in the picture, take away the spaghetti sauce. (The expression is usually the same too.) No, I’m talking about marriage and husbands and wives and how the good, the bad and the ugly all go together. By that, I mean the qualities I love most in my husband are in tandem with the qualities that drive me crazy and vice versa. A laid-back, easy-going person usually isn’t great about remembering to take out the trash or throw dirty socks in the hamper. A type-A, highly motivated, get-it-done person tends to love checklists and high expectations. Someone who is hard-working and always goes the extra-mile might be a little late to come home most nights. And someone who is highly creative and artistic might be prone to forget minor details like paying the mortgage or the electricity bill. Our strengths go hand-in-hand with our weaknesses. The good, the bad and the ugly–it’s a package deal. I don’t remember a ton from my undergraduate days in biology, but I do recall a lesson from my Genetics class. We were learning about genetic linkage and experiments on sweet pea plants and flies. (I also one time had to hunt crawfish out of a pond on campus and mate sea urchins. Who says biologists don’t have fun?) I will spare you the details because they would most likely bore you and, honestly, I don’t remember them, but these scientists found that some traits which are located in close proximity on a chromosome are transferred in pairs or groups. Ironically, this is referred to as coupling. I know you’re probably wondering what flies have to do with marriage, but those traits he has that just drive me up the wall might very well be linked with the traits I love most about him. We certainly can’t wallow in our weaknesses or use them as an excuse, but when it comes to my spouse or to my friends or colleagues or anyone I value, maybe we could step back and see that everyone is a package deal with strengths and weaknesses, gifts and flaws, good and bad. And maybe instead of trying to change them–which never works anyway–we could love them for who they are and let God change the things that need changing. No one person has it all, but every person has gifts to contribute. When we turn our focus to strengths and begin highlighting our spouse’s gifts instead of focusing on the weaknesses, we provide an environment for healthy growth in the relationship, space and grace for dirty socks and superfluous checklists. And our hearts grow more grateful. After all, when we stood on that altar and became husband and wife, I chose all of him and he chose all of me–the good, the bad and the ugly. And when Christ humbled Himself to death, He saw all of me and chose all of me–the good, the bad and the ugly–and loved me anyway. I love this post! I think a lot of people tend to forget that when you marry someone, you marry ALL of them. So true! Thank you for the reblog! Reblogged this on Becoming a ProWife.